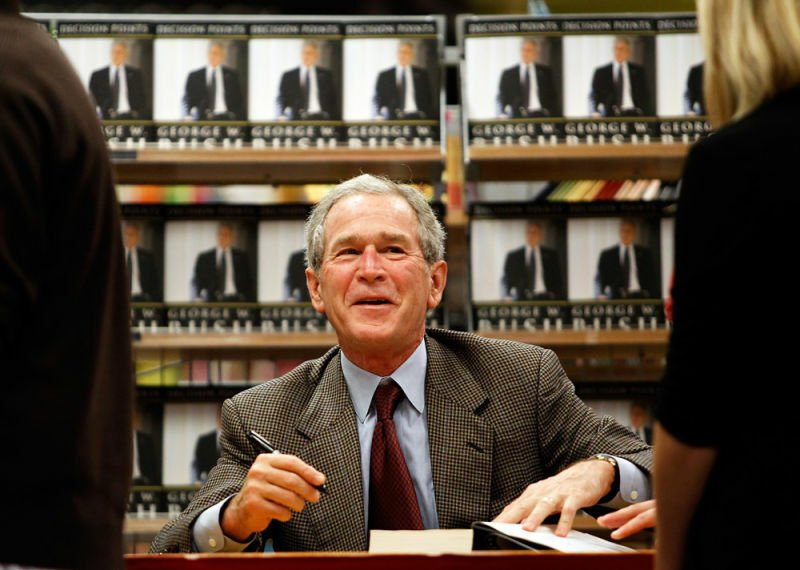 Did George W. Bush Plagiarize His Memoir? He's an idiot, so probably. 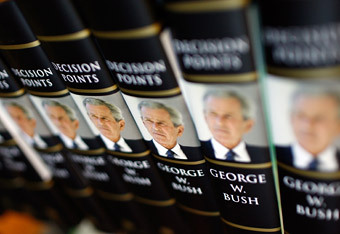 The Huffington Post's Ryan Grimm has identified several passages in Bush's new book Decision Points that he says are "lifted" from some of his advisers' books. 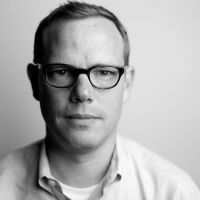 It would be kind of tough for Bush, whose book recounts episodes that have already been described repeatedly in a wide variety of books, magazines, and newspapers, to tell the stories in Decision Points without revisiting anecdotes that others have already told. And Grim basically raps him for "lifting" stories in which Bush was a player from people, like Gen. Tommy Franks and Bob Woodward, who'd already told them. For instance, Bush's account of his remarks at a meeting in the situation room match up suspiciously, in Grim's view, with Woodward's account of the same meeting in Bush at War. At a National Security Council meeting the next morning, I said, 'just want to make sure that all of us did agree to this plan, right?' I went around the table and asked every member of the room. The next morning, Bush arrived at the White House Situation Room for the NSC meeting…'I just want to make sure that all of us did agree to this plan, right?' [Bush] said. Well, what if that's what he actually said? How is Bush supposed to communicate the events of that meeting? "As Bob Woodward first reported in Bush at War, I then said...."
It is clear from some of Grim's examples that Bush relied on other people's books for direct quotes of some conversations. Gen. Tommy Franks' recollection, for instance, of one national security team meeting included quotes from both Bush and Franks that are repeated identically in Decision Points. Not the narrative, mind you, but the quotes. It certainly seems that, in the course of putting the book together, Bush's researchers checked the quotes against Franks' book and adjusted them to match, on the presumption that Franks' account was accurate. But what's wrong with that? Again, is Bush supposed to credit someone else for capturing his own words? It seems like small beer. But again, he's an idiot, so let's just say he plagiarized the damn thing. He's done worse.